In the late thirties of the twentieth century, by the beginning of the Second World War, BMW was one of the most successful car companies in Germany and in the world. However, with the outbreak of the war it had to forget about cars, preserve pre-war prototypes of sports and passenger cars and begin restoring production of aircraft engines and other military equipment. The company has already had experience in production of aircraft engines, and things went well, in the middle of 1943 the world’s first jet engine – BMW 109-003 was even developed and released, which was mounted on Messerschmitt Me262 aircrafts. At that time there were four BMW plants in Eisenach (Thuringia), where all the cars were produced before the war and two main plants in Munich (Bavaria), focused on production of engines. End of the Second World War was almost the collapse to BMW and all of its plants. Because of production of engines and missiles during the war, the Soviet command and Allied commanders banned all production of the equipment for three years and dismantled most of the equipment at the plants in Eisenach and the main plant in Munich. At production in Munich that was saved, allies allowed the company to produce only the cookware. Piquant was the fact that after 1945, all BMW plants located in Bavaria, were in the territory of West Germany (later FRG), controlled by the Allied forces, and Thuringia belonged to East Germany (since 1949 – GDR), under control of the Soviet Union, and the Soviet Military Administration in Germany (SMAG) controlled its territory, headed by Marshal Zhukov. 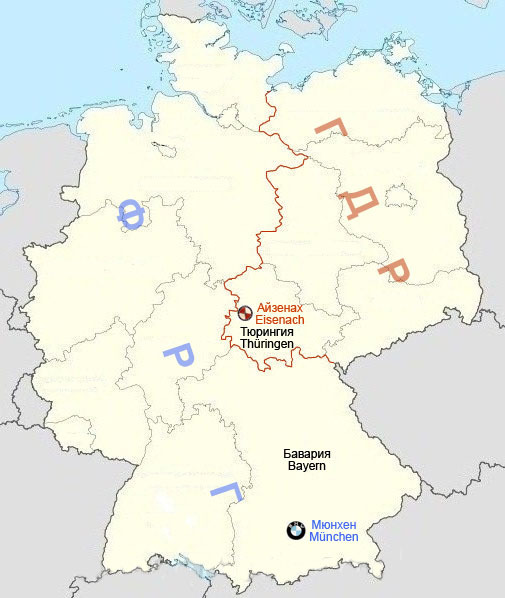 The situation for BMW was stalemate – the plants survived in Munich produce cookware, plants in Eisenach are 60% bombed by air strikes (and in fact, before the war all car production was there) and according to the Potsdam Conference, they shall be dismantled, and surviving BMW engineers Karl Rapp and Gustav Otto eager to restore car and motorcycle production (and even try to make a new home-made motorcycle engine)... The company was saved by the application of the delegation of workers of the plant in Eisenach personally to Zhukov – they managed to convince Marshal, that restoration of car production at the plant in Eisenach will be everyone’s benefit. Also some production facilities preserved, as well as warehouses of parts and spares not only in Eisenach, but also at the Berlin plant "Ami-Budd", which produced body parts for BMW 321 before the war. Zhukov agreed. And so, in October 1945, with the wording "In the interests of the people of Thuringia", SMAG issued an order "On organization of production of automobiles and motorcycles at the former BMW plant in Eisenach". Production began on survived capacities, but it was required to provide supply of raw materials, spare parts and equipment for regular production of cars, and to this end former BMW plants in Eisenach, equipment of "Ami-Budd" and "Simpson" company which produced motorcycles under the brand of ABO were joined into Soviet Joint Stock Company "Awtowelo". The company was headed and funded by the representatives of the Soviet administration, but engineers and workers were the same – the Germans from BMW plants. Products of the company were delivered to the Soviet Union on account of reparations. 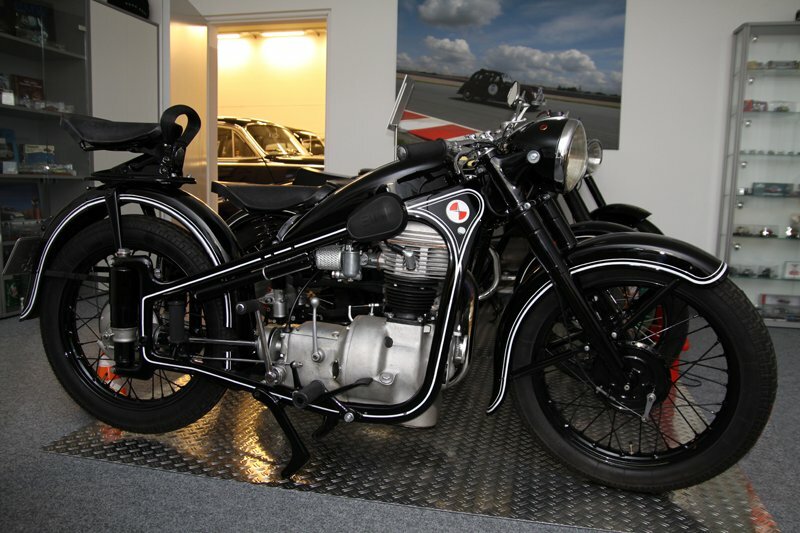 It was decided to start production with BMW 321 and BMW R35 and ABO 425 motorcycles. Model 321 has proved to be a great and reliable car, and it was produced in quite considerable quantities for that time – in 1947 – 2,035 pieces, in 1948 – 2,398, in 1949 – 2,734, which were significantly more than 321 models released before the war. Since 1947, pre-war sedans BMW 326 began to produce gradually, that have undergone minor upgrades, just a little later – sports coupe and convertibles BMW 327. 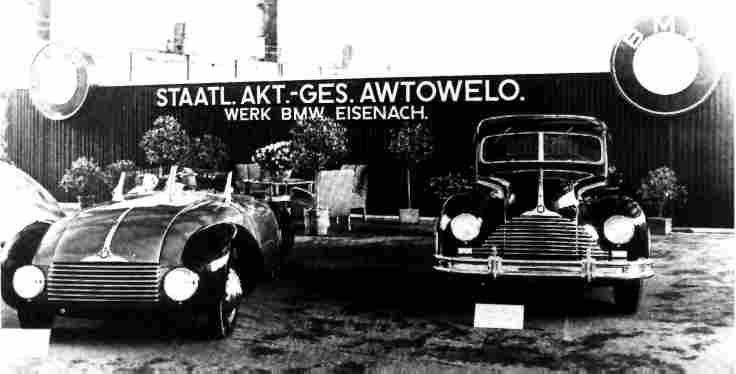 All cars built in Eisenach at "Awtowelo" had a blue and white BMW logo on radiator’s "nostrils" but on the plate under the hood it was written: "Soviet Joint Stock Company Awtowelo, Eisenach". At the same time, things were much worse at the main factory of BMW in Munich: the Allies dismantled all equipment, communication with automobile production in Thuringia was interrupted because actually now it was another state. 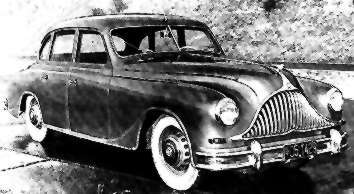 However, there were people left – for example, technical director of pre-war BMW Fritz Fiedler, the developer of successful models of the second half of the 1930-s, offered to produce a new compact model BMW 331, the other engineers were quietly working on a new sedan with V8 engine, and since 1948, small lots of motorcycles were produced in Bavaria. By 1949, automobile production in Munich was almost fully restored after the war, and BMW administration filed a petition to Awtowelo of their rights to blue and white BMW logo. 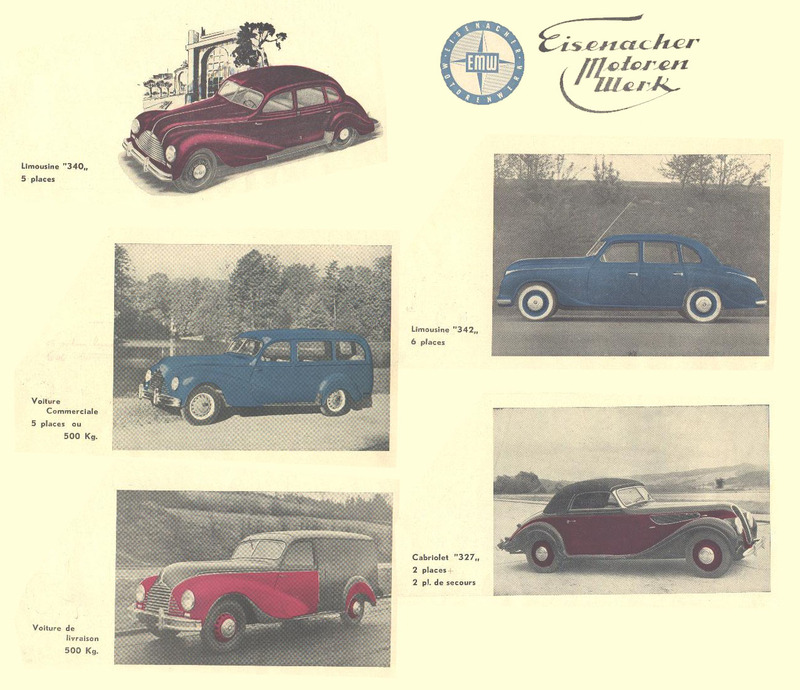 The thing was that cars from Munich were planned to be exported to Europe, and cars from Eisenach were supplied only in the USSR and in Scandinavia in small batches. In fact, it turned out that BMW under a single brand cars were produce by two different car companies and even from countries with not very friendly political system – it would cause a number of problems in the foreign market. In 1950, a lawsuit between the plants ended in favor of Bavaria. They won by court action their old blue and white BMW logo – aircraft propeller blades on blue sky background, at the same time reminding the blue and white flag of Bavaria, and Awtowelo had to be renamed to EMW (Eisenacher MotorenWerk) – Eisenach Motor Plants, and change color to red – the result was a red and white logo, symbolizing the red and white flag of Thuringia. Since 1949, new prototypes BMW 342 and BMW 340 (based on the pre-war BMW 326) began to be built at the plant in Eisenach. BMW 342 body was developed by a talented draftsman of sketches Hans Fleischer returned from captivity, who worked at the plant in Thuringia since 1935. 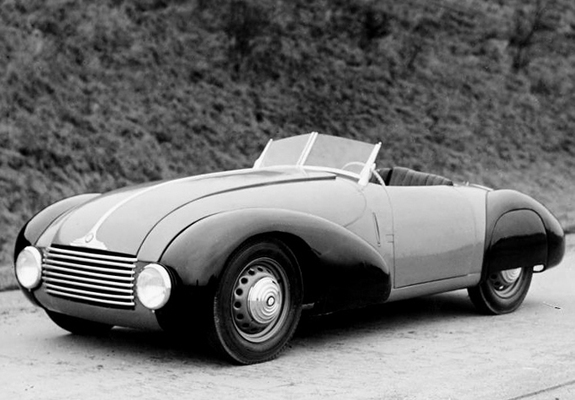 After his return in 1949 he became a designer of car bodies. 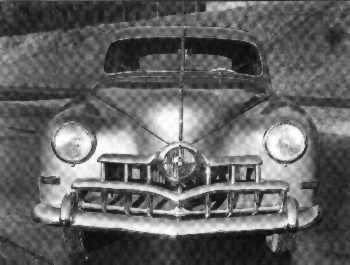 After founding EMW, it had to replace 342 model’s radiator grill "nostrils" with a new simple grill, such as in 340 model. This was due to the requirement of BMW plant in Munich. 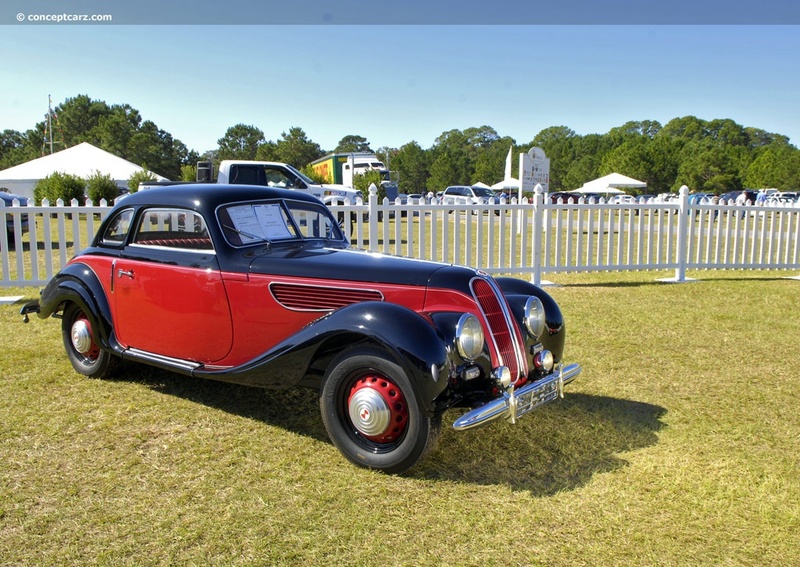 Based on 342 model, BMW 343 prototype of was also designed with elongated body and grill, slightly reminiscent of the American car style of that time. However, neither 342 nor 343 models were released in the series. Since 1949, only BMW 340 was produced, and since 1950, it was renamed to EMW 340. 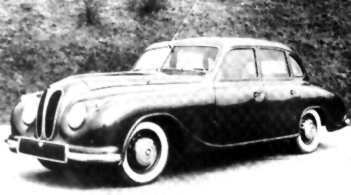 In 1951, BMW in Munich presented a new car – BMW 501. 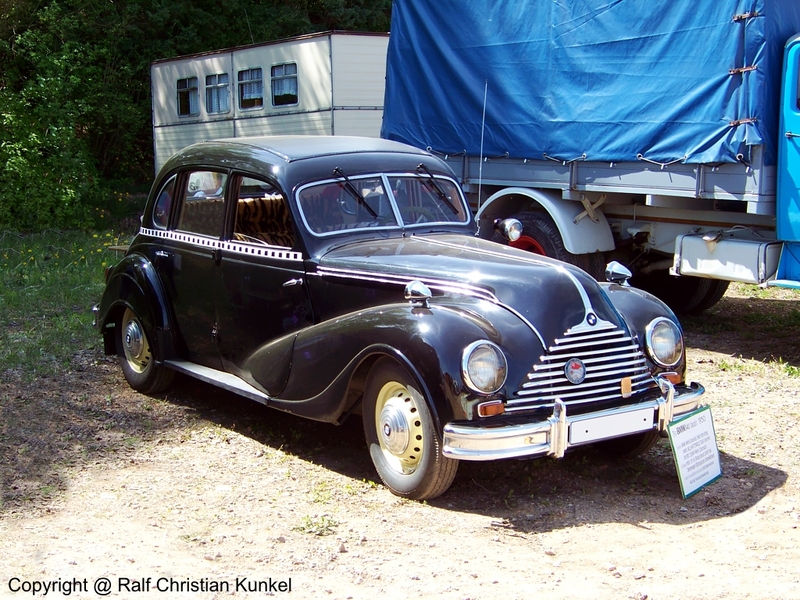 It was slightly reminiscent of a prototype BMW 342 of 1949 from Thuringia (probably engineers in Munich and Eisenach were based on similar pre-war developments). However, due to the high cost, 501 model was sold quite bad – within three years just 1,000 copies were scarcely produced. 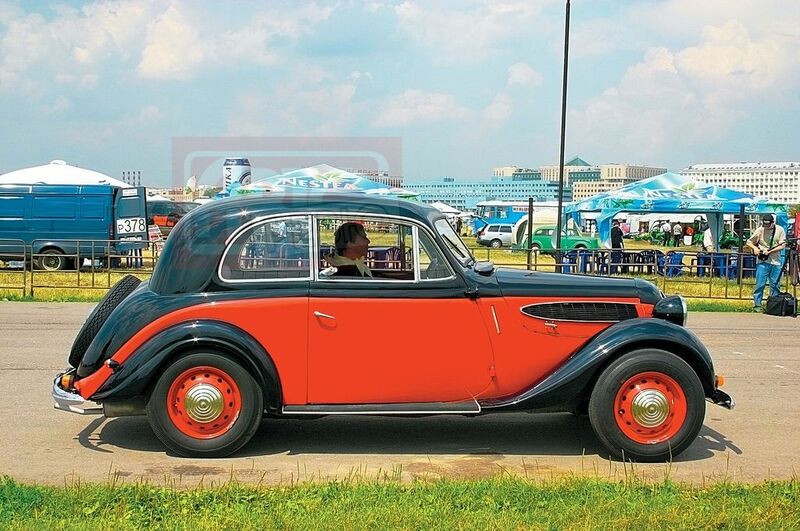 Production of EMW 340 in GDR at the same time was much better – until the end of production in 1953, more than 20 thousand cars were made, and many of them could be met in the USSR. 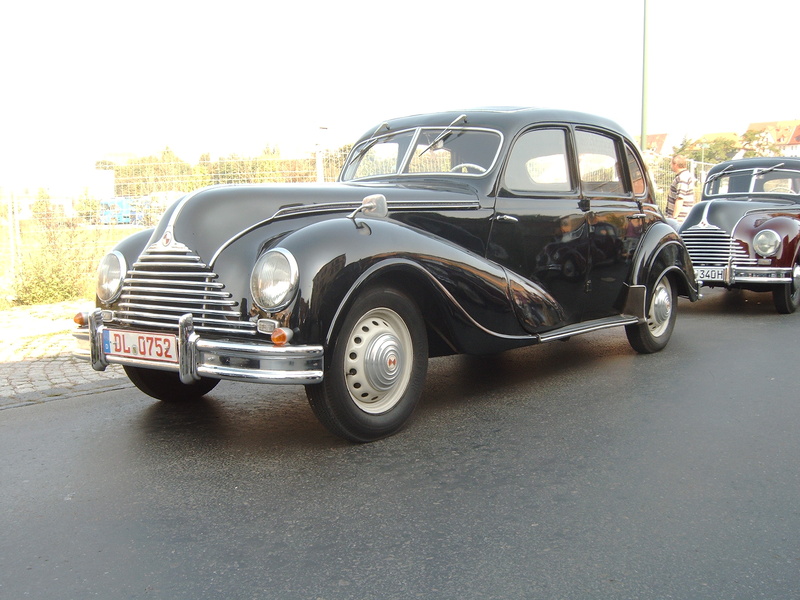 After 1953, EMW plant switched to production of front-wheel drive models Wartburg and IFA-F9. In Munich, at the end of the 50-s, things were rather bad – expensive models 501 and 502 were sold poorly (price of BMW 502 at that time was about 14,000 marks, and for example, Volkswagen Beetle – about four thousand), soon they were supplemented by luxury sports models BMW 507 and BMW 503, which also were not very popular because of even more expensiveness (although they were considered very stylish and dynamic cars). 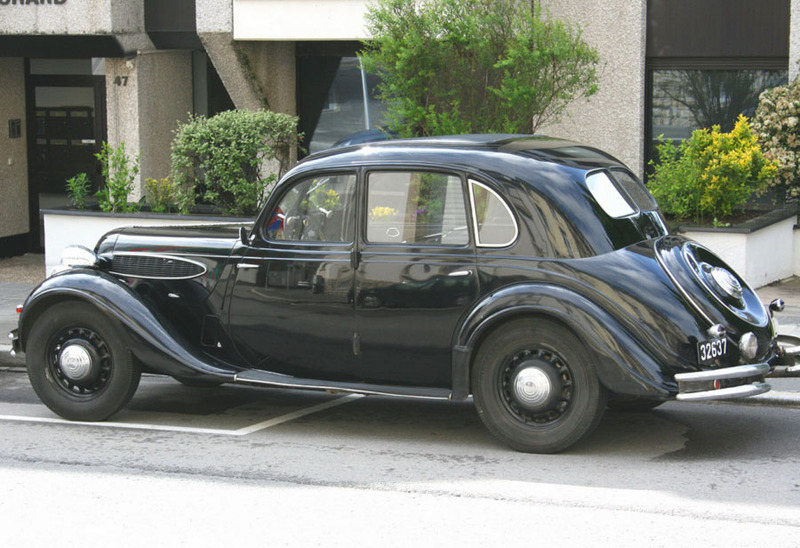 At that time, Munich plant was nearly taken over by Daimler-Benz company, it kept afloat only due to BMW Izetta model – cheap small people’s car. However, a prototype of "new class" – BMW 1500 was on its way – a new era for BMW.